Riot police have used tear gas to disperse a crowd of demonstrators outside an Alexandria courtroom where a former police chief and five other officers are on trial over the killing of civilians during the 2011 uprising that ousted Mubarak. ­Dozens of family members of those killed during the uprising along with activists led the demonstration outside the Alexandria courthouse. Protesters have called for ‘qisas’ – Arabic for ‘retribution’ – for those injured in the violence. Police used tear gas to disperse the crowd that had become outraged by the idea of the police officers on trial walking free. At least three demonstrators and three security officers were injured in the clashes, AP reported, citing witnesses and state media. 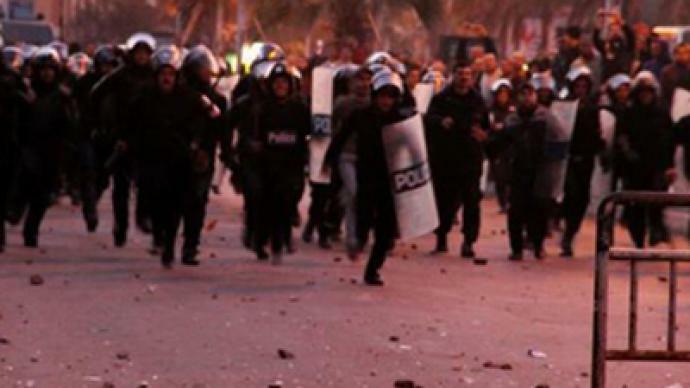 A conflicting report by Ahram news agency suggested that two people were injured in the violence. 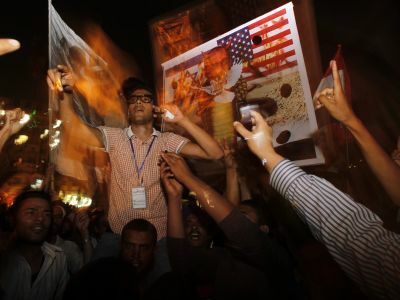 While AP has reported that the cause of the clashes was unclear, Ahram said the violence allegedly began after security forces attempted to put up fences to ward off demonstrators and the families of the dead. Those gathered reportedly refused to leave, which led to the violence. Ahram’s Arabic website also reported that police beat protesters with batons, and that both sides threw rocks at each other. Later in the day, clashes continued after Judge Mohammed Hammad Abdel-Hadi denied the prosecution the right to call witnesses in the case. The verdict in the trial against police officers who participated in the killing of non-violent protesters on January 25, 2011, is set to be announced soon, but the exact date and time remain unspecified. 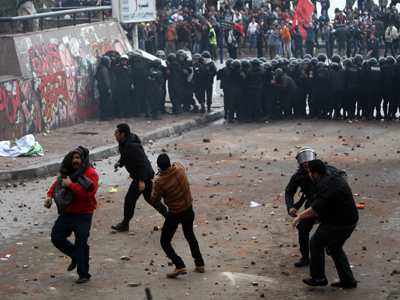 So far, nearly 100 police officers have been brought to trial for killing and wounding protestors during the revolution that deposed Hosni Mubarak in 2011 – all of them have been acquitted or received suspended sentences. Mohammed Ibrahim, the former security director of Alexandria, is currently on trial along with five other police officers for using excessive violence against protesters. 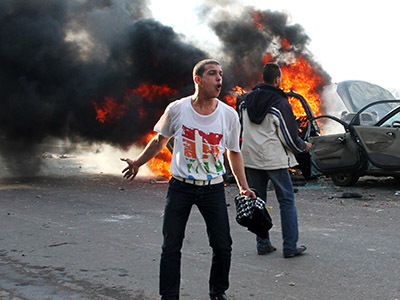 Out of some 900 killed nationwide during the 18-day 2011 revolt about 300 people were killed in Alexandria. 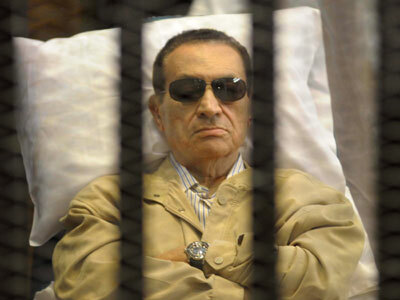 After the fall of the regime, Mubarak and the former interior minister were sentenced to life behind bars for failing to stop the bloodshed but were granted a retrial this month. It was not clear what kicked off the clashes with the police during the Saturday’s hearing, although there have not been reports of any injuries. The father of one of the young demonstrators killed by the police during the revolution spoke to AP of his grief and the toll it has taken on his family. “Imagine spending 18 years wanting a son and finally having Mohammed,” said Ramadan Ahmed, a retired naval officer, whose son was shot in the head by police on January 28, 2011. Ahmed said he voted for Morsi and met with him after he was elected last summer in Egypt’s first ever free presidential vote. “I told him there must be justice for my son. He took the picture of Mohammed and another boy from Suez and kissed it. He asked to keep the pictures and was clearly affected,” said Ahmed. But despite Morsi’s show of sincerity, Ahmed doesn’t believe that the judge will send any of the officer’s on trial to jail. “It is one long chain of corruption, no-one alive will get their rights until the people who died do,” he said. 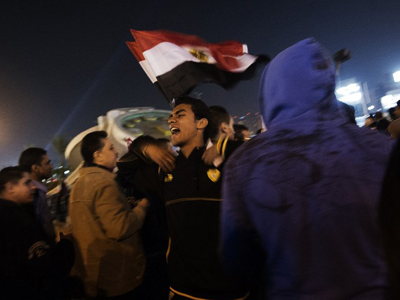 Egypt military use ailing Mubarak as scapegoat?